The Blaine County School District now has a plan in place to involve the community in textbook selection. However, anyone interested in helping the district choose new science textbooks that hasn't yet applied to serve on the committee has already missed the deadline. The board of trustees approved the plan on Wednesday, Feb. 29. The district announced Thursday evening on its website that it was accepting applications for the science textbook committee. The deadline for applying was 5 p.m. Tuesday. 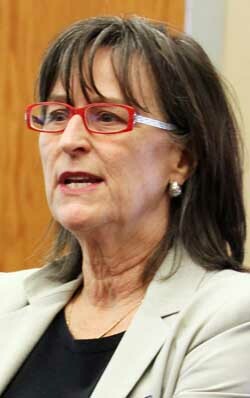 District Curriculum Director Patricia McLean said Monday that she would have preferred to have given the public more time to apply but that school board approval took longer than she had originally anticipated and that she couldn't advertise for applications until after the plan was approved. The board first considered the plan at a special meeting on Jan. 26, considered it again at the regular board meeting on Feb. 21 and finally approved the plan at a special meeting on Feb. 29. Driving the schedule, McLean said, are long-ago scheduled meetings for March 12 and March 14 when a science textbook task force will begin narrowing a list of possible textbooks to final candidates who will receive a much more thorough screening. "We want to bring them [community members] in as soon as possible so they can feel like they are involved even in the narrowing process," McLean said. The district is looking at new general science textbooks and other instructional materials for grades K-12 for use beginning in 2013. McLean said there are two main reasons why she developed the plan. First, she "philosophically" believes the public should be involved in textbook selection and she wanted to "have a responsible process, and raising your hand is not going to get us there." Second, the plan was developed because of parent and public criticism leveled last fall about lack of public involvement in selecting new math textbooks. "There had been some criticism of this in the past, but there hasn't been a history of public involvement in textbook selection in the district within the past several years," she said. The new plan requires that selected community members be prepared and available for textbook selection committee meetings, which could last a full day. It requires that members "exercise honest and respectful communications in both public and private conversations." Community members are required to possess "academic background, skills and knowledge directly related" to the task and to be "supportive of [Blaine County School District] philosophy, values and beliefs and those of the subject committee." The plan also requires community members to be "supportive of [Blaine County School District] board of trustees, superintendent, cabinet and teachers." Any community member not meeting "stated expectations" can be removed for the committee by the district superintendent. The plan states that the ratio of community members to teachers involved in textbook selection will be "about 1:5." To apply to the science textbook selection committee, community members needed to fill out an application form describing their academic background and past experience with "positive and constructive communication and engagement in a decision-making organization." Applicants were also required to list all children currently or previously enrolled in the district. Applicants were further required to attach a confidential letter of recommendation from a school principal or other public official. The Idaho Mountain Express contacted several school district patrons who were critical last year of the new math books selected and the process used for selecting them. The critics were asked if they were satisfied with the district's new public involvement plan for textbook selection. Only two of six contacted provided comments by press deadline Tuesday. Blaine County businessman Paul Hartzell, a former Major League Baseball pitcher, wrote in an email that while the deadline for applying to the new science textbook selection committee seemed somewhat short, he didn't think it was unreasonable. "I think the process of notifying and involving parents and other participants is acceptable," Hartzell wrote. Parent and Hailey resident Ellen Mandeville, a leading critic of the math textbook selection process, offered a different perspective. "I am pleased that the board of trustees and the district administration is coming back into compliance with district policy," Mandeville wrote in an email. "I'm concerned that the emphasis on 'past ... positive and constructive communication' might be a way to exclude people who have angered district administrators. "The submission time period of only three working days is ridiculously short and completely unacceptable. Especially considering the requirement to 'attach a confidential letter or recommendation.'"